I just went outside to the boys cleaning their bikes while waiting for me to open the gate. How sweet they looked with their bikes lined up in order of their ages while taking care of what they have been given. Tis the season for baking (and online shopping! Just saying). I'm not a regular baker, but for some reason when the cold weather comes I get inspired to bake and my family loves it! The first picture below is my grandma's lemon apricot bunt cake. I went to the store about five times looking for apricot nectar but they were all fresh out. So this ended up being all lemon which is Aaron's favorite so no problems there. This was actually my first bunt cake too and it came out great. My kids aren't big cake eaters so you know it's good when they ask for cake for breakfast, lunch, and dinner! 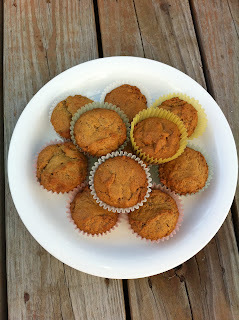 Next I made peanut butter banana muffins for breakfast. 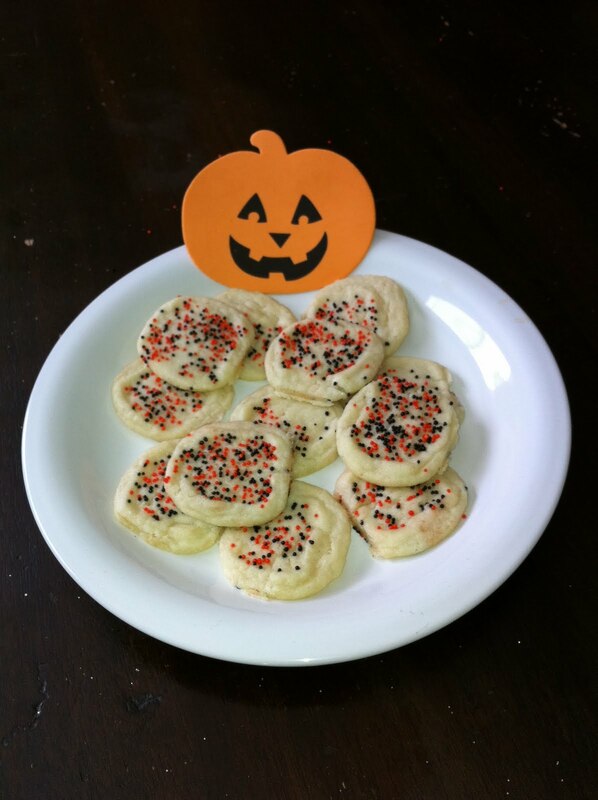 I made them once before and they are delicious. 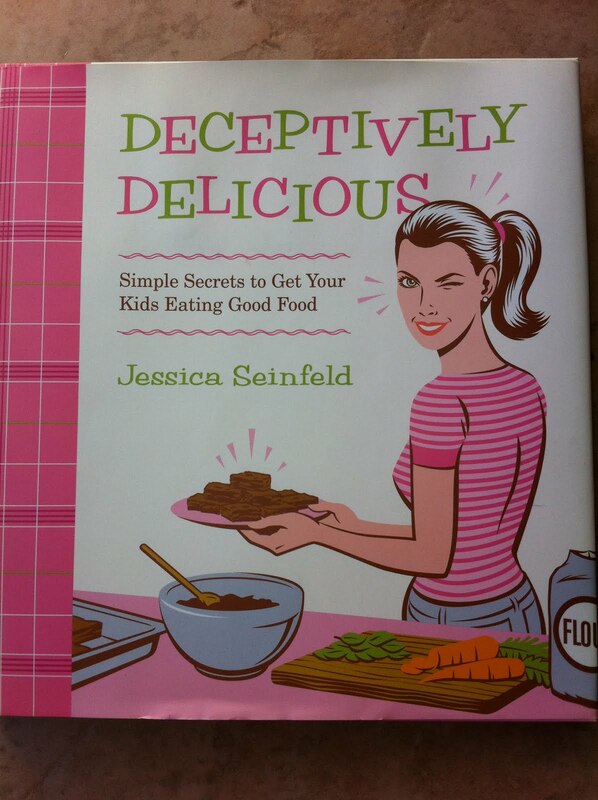 The recipe is from this book Deceptively Delicious. 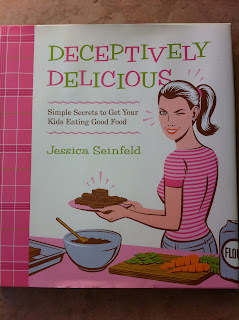 All of the recipes in this book have hidden pureed vegetables in them so the kids get their veggies without even knowing it. I've made most of the recipes without the veggie purees because it is a little bit of a process but everything has still been tasty and I feel great serving it to my family because I know it's healthy. The boys are finally enjoying this pumpkin season. Here they are making sugar cookies with black and orange sprinkles (see below). It's hard to see, but behind them we decorated the window with pumpkins and leaves. We put up our fall wreath on our front door and decorated the house. Today we are going to carve their pumpkins. The boys can't wait. You might be wondering what Mazie has been doing all this time? One word: Bumbo! We love that thing and so does she. She sits in it anytime she's awake and loves it. I give her a tiny tupperware top that she can hold and she goes to town chewing and drooling while giving us a piece of her mind. More pics to come. Happy pumpkin season! On our last surprise date night we tried something totally new. 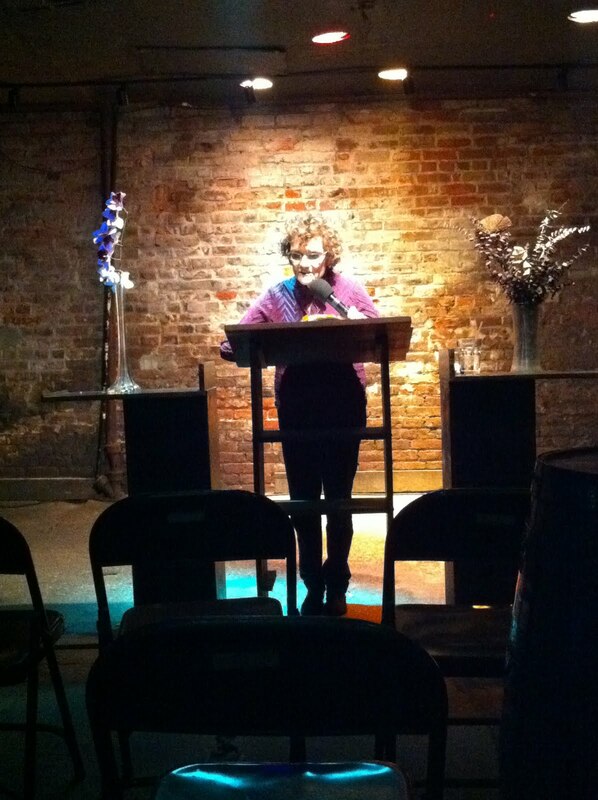 We went to a poetry reading. We've both always wanted to go to something like that but never have. It was interesting. Not the coolest thing we've done. A little strange, but we're glad we had the experience together. Before we were married, Aaron was in New Orleans and I lived in Dallas for college. Our whole dating/engagement was long-distance and six months after we were married I was pregnant for Gabe. Although we've been able to travel many places together, we feel like we kind of missed out on the dating experience as far as making memories. We've always dated, but now we're making memories. For that reason, we're glad we went to the poetry reading. Definitely something we'll never forget. It's Not So Happy Pumpkin Time!! I had to respond to my Aunt's comment about them not looking too happy. Probably because they weren't. My sister went to a fun one with rides, animals, a picture area, and more. We went to a church neighborhood one and it wasn't the best for older kids. The last time we went there, Gabe was a 1yr old and we took all kinds of cute pictures and he had no idea where he even was. It was great! This time, all we did was get our pumpkin & leave. It seemed kind of stressful actually. I told them they could have the one they could carry thinking they would pick a small one because they were priced by the size. Gabe, being the first born that he is, kept trying to pick up huge ones and I had to keep telling him no. Judah, his wonderful second born sensitive self, kept crying because he said he couldn't pick up any of them, and Isaiah, the baby boy, kept changing his mind. I eventually tried to pick it for him and he kept saying, "No not that one!" and then got upset. Not fun. I think we are going to try out my sister's place. Today I am in one of the best couples in the world's wedding. Aaron is marrying them. Since we are both involved, my mom took the boys yesterday afternoon. Last night was the bachelor/bachelorette festivities that lasted into the early morning hours. Aaron slept out with all of the guys so Mazie and I had the house all to ourselves. We slept 9 hours with only one feeding interruption!! This morning I feel great. I'm really enjoying a quiet house and a simple breakfast (scramby eggs, coffee, and raisin bread toast. Music is on in the background. Mazie is sitting in her Bumbo watching me eat with her giddy feet and her pretty blue eyes. Apparently someone else got a little taste too!